In continuous production for over 10 years, it counts among its growing list of fans: coders, lawyers, judges, poets, playwrights, comedians, movie critics... writers of every sort. There was a time when the best keyboards in the world had ALPS mechanical keyswitches — legendary designs by Apple, IBM, SGI, Northgate, and others. 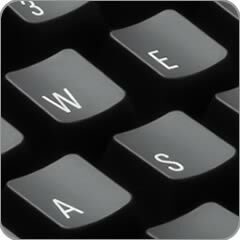 While lesser (cheaper) technologies have since taken over, the Tactile Pro has endured and remains faithful to the original feel, speed, and quality offered by ALPS mechanical keyswitches. We've kept this technology alive and love using it as much as you will. When you press a key, tactile feedback lets you FEEL the exact spot where it triggers. This makes it EASIER to type faster and more accurately — because each finger now knows when its work is done. In particular, you'll experience FEWER transposition errors, which happen when you press the right keys, in the wrong order. Gaming keyboards are great for gaming, but they're not tactile. Without tactile feedback, you can't feel the actuation points. You either have to press the keys all the way down (extra work) or just guess how far you need to press. That's the exact opposite of what you want in a good typing keyboard. The latest trend in keyboards is to have very flat & wide keys, with little or no space between them — virtually all laptops have them now. While they look great, they can also be a little tricky to type on. The flatness makes it very easy to slide out of home row and lose your bearings. All those symbols are handy, but what happens when they wear off? They won't. They're laser etched — burned into the keys with a laser — so they'll never wear off. Some keyboards have 2 USB ports — most have none. We're giving you three!. 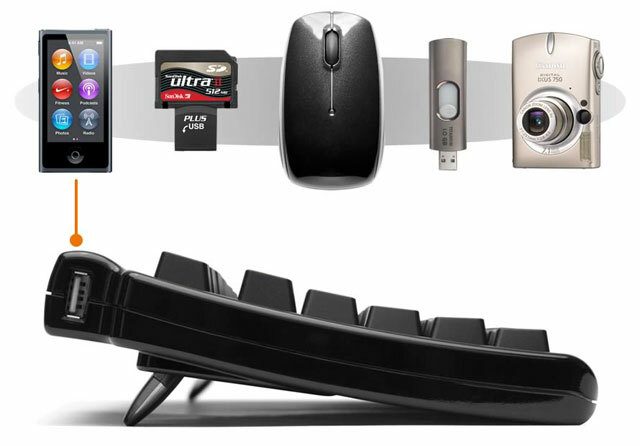 You can plug in flash drives, digital cameras, your mouse, and more. It's a huge convenience. Dedicated keys let you control Volume Up, Volume Down, and Mute. 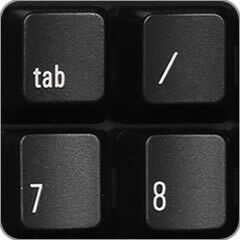 For users who do a lot of spreadsheet work or accounting entries, we've added a Tab key to the number pad. It streamlines your workflow, and saves you time. Most keyboards allow only a few keys to be pressed at once, so they can't keep up with very fast typists. The result is called ghosting — letters missing from what you actually typed, or additional letters that you didn't type.